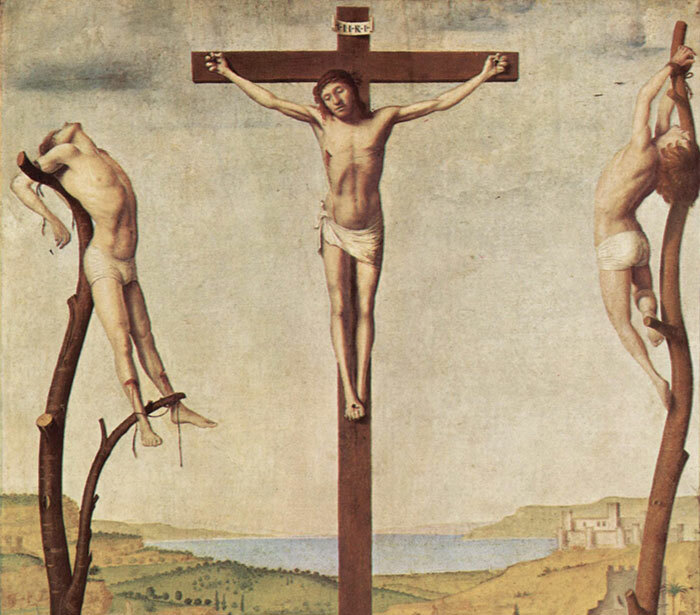 The Crucifixion is the subject of three different paintings by the Italian Renaissance master Antonello da Messina. The first two were completed around 1454/1455, the third in 1475. They are housed in the Brukenthal National Museum (Sibiu, Romania); the Royal Museum of Fine Arts of Antwerp (Antwerp, Belgium) and in the National Gallery (London, UK), respectively. In the nineteenth century, this painting was believed to be by a fourteenth-century German painter. However, since 1902 the attribution to Antonello da Messina is universally accepted, and the panel is considered to be an early masterpiece of the artist. It is the earliest work in a stylistically related series on the subject of the Crucifixion, continued by the versions in London and Antwerp. In the version at Sibiu, Antonello portrays the landscape behind the Crucifixion - the city and the Strait of Messina - from a bird's eye view, from an almost topographical perspective. The Antwerp Crucifixion represents Christ crucified between two evil-doers, with Mary and John the Evangelist seated on the ground. The work shows a landscape typical of the Flemish school in the lower part. The well devised spatial disposition of the crosses in the upper half demonstrates a full knowledge of the innovative method of perspective known to Italian art of the period. The Italian scholar Roberto Longhi asserted that the upper part was added several years later. Belonging to a later phase, the London Crucifixion is one of the few paintings signed and dated by Antonello: "1475/antonellus messaneus/me pinxit". The geometrical composition is divided in two parts by the cross and the lake in the background, with the Virgin on the left and St. John on the right. Antonello da Messina was an Italian painter who probably introduced oil painting and Flemish pictorial techniques into mid-15th-century Venetian art. Vasari says that Antonello brought the 'secret' of oil painting to Venice. While this is probably untrue, his San Cassiano altarpiece was certainly influential, for several younger Venetian artists borrowed directly from it and Giovanni Bellini admired the modelling of its figures. His practice of building form with colour rather than line and shade greatly influenced the subsequent development of Venetian painting. From 1475 to 1476 Antonello was in Venice and possibly Milan. Within a short time of his arrival in Venice, his work attracted so much favourable attention that he was supported by the Venetian state, and local painters enthusiastically adopted his oil technique and compositional style. Among his known works from this period are a Crucifixion (1475, Koninklijk Museum voor Schone Kunsten, Antwerp) and the San Cassiano Altarpiece of which only two fragments remain (1475-1476, Kunsthistorisches Museum, Vienna). In St Sebastian (c. 1476; Gemäldegalerie, Dresden), his most mature work, Antonello achieved a synthesis of clearly defined space, monumental, sculpture-like form, and luminous colour, which was one of the most decisive influences on the evolution of Venetian painting down to Giorgione's day. In 1476 he was again in Messina, where he completed his final masterpiece, The Virgin Annunciated (c. 1476; Galleria Nazionale, Palermo). This page uses material from the Wikipedia article Crucifixion (Antonello da Messina), published under the GNU Free Documentation License. Wikimedia Commons has media related to: Antonello da Messina paintings.